It’s about time. My life has settled into a routine. Running my office, working out, doing the dishes, and apparently, ignoring my blog. In an effort to make sure said blog didn’t become an endless list of workouts, I set it aside completely. But I’m back. So, let’s just get this out of the way now. 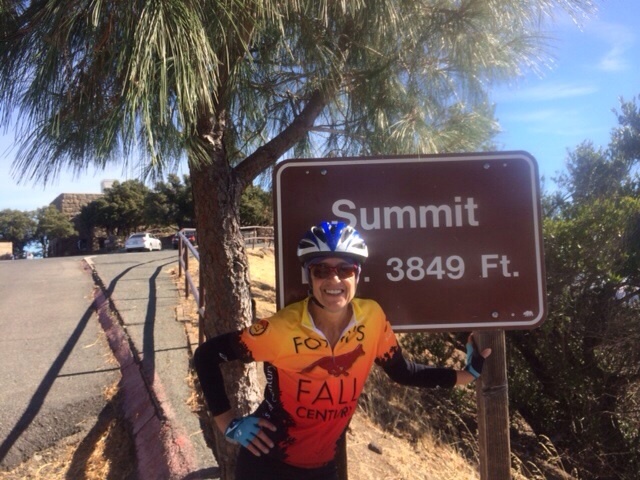 In the last month, I celebrated Day 60 with a 60 mile bike ride in Davis, the Foxy Fall Century. (I chose the metric option, just 100K, not miles, I mean…. I’m not crazy) I rode with some great people….Marie, Dorene, and my new friends Cathy and George. An organized ride is a great way to enjoy a long ride because they feed you. A lot. A few days later, my buddies Margaret and Renate and I rode all the way to the summit of Mt Diablo. We knew we could do it, but I have to tell you, the last few hundred yards are very steep…just what you want at the very end. But what a blast! I felt like Queen of the World! On the running front, life has continued to move toward normal. I was hoping to achieve a 3 mile run in under 30 minutes and I managed to eke that out in the first week of November. I’m doing some intervals on the treadmill at the gym, which is forcing me to run faster for very short periods of time. Although I walked more than usual, I did a 10 mile trail run on Saturday. It’s coming back and it’s sooner than I had originally hoped. I’m really happy. You might ask why all of this is so important to me? What exactly IS the rush? Why does it all matter how fast or how far I can run? Like many runners, it is my passion. I love setting goals, I love running in races and I love running with my friends. I love being part of things. It’s just who I am. Obviously, I want to have what I had before. It will happen. But…. I’m not very patient. I don’t think I’ve ever been. The last couple of years have not helped me develop that virtue. A little history might help explain. In 2007, I started running and by the next year, much to my surprise, I was fast enough to qualify for the 2009 Boston Marathon. Although I repeated that enough times to run it in 2010 and 2011, those two years were not good for me. I was in a running slump. At the beginning of 2012, I found a solution. I began training with my wonderful coach, Andy. After spending most of 2012 getting back into shape, I was fired up at the beginning of 2013 and planned to run a spring marathon. Not only did I want to qualify for Boston again, but my dream became to run it with a couple of very dear friends of mine, Paula and Erin, who I had met about the time I met Andy. But trouble came along. I had plantar fasciitis in my right foot, which was so painful, I stopped running for almost 5 months. By the time it was better, I had gotten my diagnoses of Amyloidosis and was starting chemo. Fortunately, I was able to run during treatment, but just as I was training for another marathon in the fall, I was diagnosed with a condition in my neck and told not to run until I had surgery. This would not likely take place until I was done with chemo. Two opinions later, I was cleared to run but my marathon had passed. So I found another one in March of 2014. I was back running again, and in spite of the interruptions in training, I was cranking out some of my best training runs ever. Unfortunately I pulled a muscle two weeks before the race and it took eight weeks to heal. By the time it did, we had decided to do the stem cell transplant in the summer. I developed a pain in the other leg. It was clear there would be no marathon before the transplant. It would have to wait until after. And there was no telling how long it would be before I would even be able to train. Now, it’s ‘after’. I was told it could be a long recovery, but I am running now. What could have killed off any desire to keep going, has only made me more determined. I should be patient to let nature take its course, but I will be honest here. I’m hoping for some smooth sailing for a while, but I have learned to expect the unexpected. More than 2 and half straight months of running would be a dream come true. I’m hopeful. But I’m scared. But hopeful. Mostly hopeful. Very determined. Some would say obsessed. I prefer ‘driven’. As for now, I try to just keep moving forward and do something every day to advance me toward my goals, even if that means a rest day. I know I have to keep working toward my goals. I know I have to believe in myself. I am. I do. I am driven. Kim, you are phenomenal!!! I am SO happy you’re back following your passion! Your family has a great deal to be grateful for this Thanksgiving.